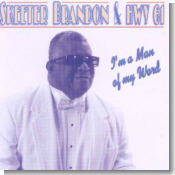 I'm A Man Of My Word is the fourth release on New Moon Blues by Skeeter Brandon & Hwy 61. But this fine singer from North Carolina still remains one of the blues world's best-kept secrets. That's surprising, because Brandon is a major league talent. Brandon possesses a powerful, soulful voice, with obvious early training in the choir loft. But that's not all. He's also a very talented piano player, again as a result of his early years playing gospel music as well as a three-year stint nearly 30 years ago as the keyboardist for soul great Clarence Carter. Brandon's piano prowess is immediately showcased on the opening jump blues "Sugar Mama." Some of his best vocal work can be heard on the title song, a mid-tempo blues highlighted by the guitar work of Max Drake. Most of the songs on I'm A Man Of My Word are Brandon originals. But the absolute killer tune here is a cover of "When A Man Loves A Woman," on which Brandon's voice frequently goes into a chilling falsetto. Brandon's style of music is really hard to classify, as he moves freely from a blues rhombi like "Blues Down In My Bones" to a jump-style drinking song "Gettin' Loaded." Skeeter Brandon has been the East Coast's secret too long. It's time to share this man's wonderful music with the rest of us.